Here’s a movie review. Thanks to ‘Deep-ends’. Based on the 2004 novel, These Foolish Things, by Deborah Moggach the story of The Best Exotic Marigold Hotel is basically about a collection of Brits of retirement age who for various reasons, mostly financial, decide to spend their retirement at what appears to be a luxurious palace in Jaipur, India that has been renovated into an attractive retirement home. 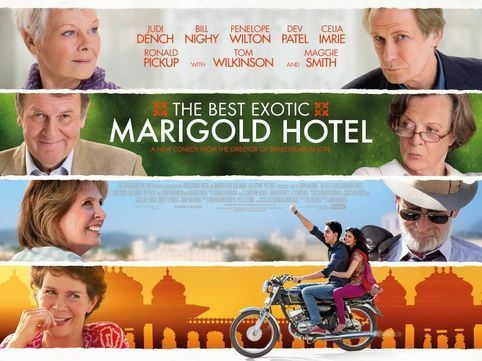 The 7 retirees undertake the physical journey with all the inevitable hiccups but the palace turns out to be a dubious, run- down place where the phones don’t work, there are no doors, the dirty, grimy accommodations are less than inviting and the whole fiasco is run by the hopelessly inexperienced Sonny Kapoor (Dev Patel). In his words, he wants to create a home for the elderly, so wonderful, that they will simply refuse to die! The stage is set for a collision of cultures, misunderstandings, life lessons and an eventual meeting of the ethnic minds. Gradually we learn the story of each of the characters. The film has an stellar cast that manages to make all the main characters enchanting in their own way. The brilliant cast are well served by an intelligent, witty script with some dry, British humor thrown in and some killer one-liners like one of the character’s, Jean Ainslie’s, response to Alu Gobi ka Parawntha… “If I can’t pronounce it, I don’t want to eat it!” Occasionally it gets sentimental, but that is what gives the comedy a story. It’s good to see a film that doesn’t treat old people as nutty idiots. The characters are intelligent & funny. This is an entertaining and wholesome film that I recommend highly! My only criticism of this film is Dev Patel’s over-acting. He looks 16 but the character he portrays was actually well into his 20s. Partly that he doesn’t look his age but mostly I think the problem is that he is a British Asian and his fake, put-on Indian accent is way over-done. I mean, who really talks like that? In my opinion, an Indian actor like Rahul Khanna would have done the role far more justice. I went to see this film with a bunch of friends who are of Indian origin and many complained that it is always the underbelly of India that is portrayed in films. To be honest, as a person living in the west who is fascinated by India, I am not really interested in seeing a sprawling metropolis that could be any other city in the US. The rickshaws, fruit and vegetable carts, camels and elephants make India uniquely Indian and when I go there in the movies that is what I want to see. Not shiny, glossy malls with air-conditioning and the same stores that I would find anywhere else in the world. Conclusion: This is an entertaining and wholesome film that I recommend highly! I give it 5 stars! It’s not playing everywhere but look for it and make it a point to go and see it!